Although a tremendous quantity of effort has been invested toward research on the Homopolar phenomenon, still today after more than 180 years following its identification by Faraday, very little information has been made public and its usage has not yet found its way into our daily lives. Its awkward since it is known in the scientific community that the Homopolar electric generation is naturally Extra-Efficient. The single engineering challenge has been all along the conception of a working unit which does not cripple the generation process while tapping this freely given energy. The goal of the present document is to bring some insight on the working principles of various contractions which by definition are employing the Homopolar phenomenon. I hope it will be of service to all. The Homopolar electric generation process refers to a moving electric conductor enclosed by a unidirectional and constant magnetic field. 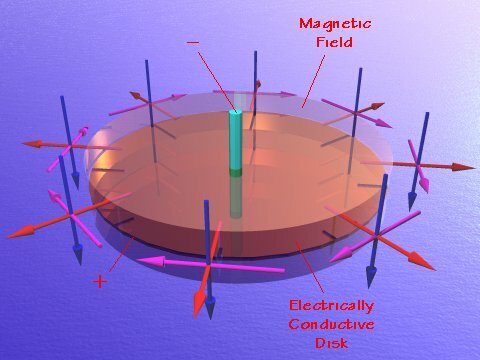 In this phenomenon, there is a compulsory relationship between the electric field, magnetic field and inertia. The generated electric power is directly determined by their magnitude. Every time exist a flowing electric current also exist a magnetic field and vise versa. Furthermore inertia is the consequence of a moving mass in the surrounding space, occasionally called the Aether. It is well recognized that the empty space is actually a fluid medium of extreme energetic density having strong inertial qualities. A simple way to visualize the inertia of a fluid is by observing for example a vortex in a volume of water, the swirl keeps its momentum for a long period of time, independently of its surrounding. Another immediate observation is made when a force is imparted to a mass : the mass accelerates and continues on its course indefinitely unless made to stop. It could be proposed that the reason for this is due to the relation of the mass constituent atoms with the Aether, creating a flow of the later, in the same direction and velocity as the displacing mass. Since a relative movement is absolutely required in order to have an electric induction, this would suggest that it is rather the Aether flow which is the subjacent working principle as it will be shown later. The opposite is also demonstrable in the case of a motor. A flowing current with a perpendicular magnetic field will provoke a flowing Aether and subsequently the object will be carried away by this flow. The Homopolar generation principle goes as follow: Electricity is generated when an electric conductor is moving while being submerged in a magnetic field. Briefly, if the movement (Magenta) of the electric conductor is perpendicular to the magnetic field (blue), then the generated electrical current (red) will start flowing in a direction perpendicular to the two first. The same is also true when applied to a motor (The electrical polarity changes since now electricity is supplied to the motor). Since the electrical energy produced by the Homopolar generator is a pure direct current (DC) such as with a battery, the power is constant and always optimum. Furthermore, the generated tension (Volt) is not affected by the amount of current (Ampere) witch is drained from the generator, contrary to any other power source, and the power generation process is not reflected back to the prime mover as an additional work load. When applied as a motor, the motive torque in constant, immediate and always optimum. Lets now look at various contractions to better understand the application of this phenomenon. The faraday disk is one of the primitive Homopolar generator design which enabled Faraday to establish the foundations of the electromagnetic theorem we still use in our modern days. It was jointly proposed alongside the alternator during his research. 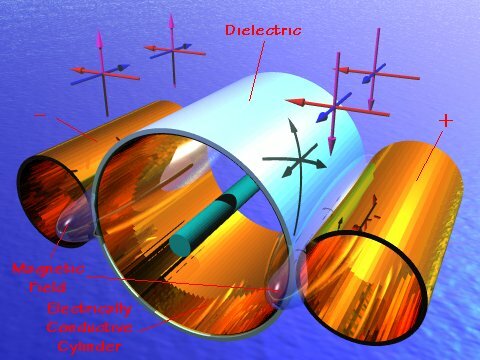 This configuration, also known as the Axial Homopolar generator since the magnetic field runs parallel to the axle, generates electricity between the axle and the periphery of a fast revolving electrically conductive disk. 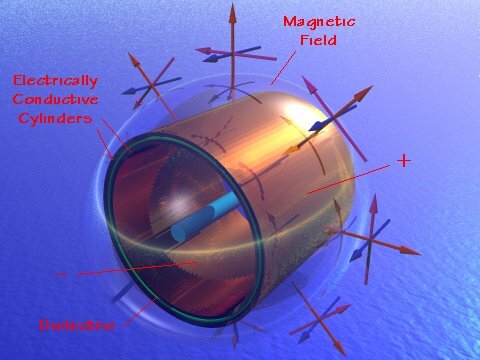 Eddy currents are alleviated by having a uniform magnetic field enclosing the entire mass of the disk. Faraday has furthermore demonstrated that, by fixing a permanent magnet onto the disk, the generation process remained operational, even so the magnetic field source was also revolving. This is called a co-rotating rotor. 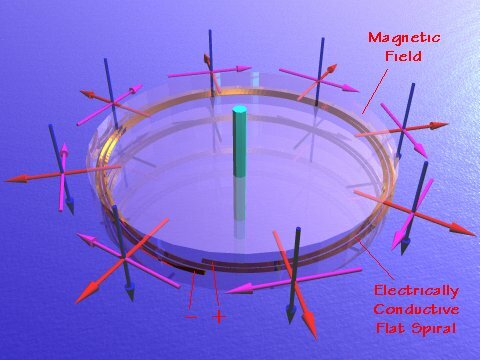 Efficiently wise, this Axial configuration is flawed by not utilizing in the most efficient way the available electric conductor mass and magnetic field energy, since the actual maximum conductors speed is only found to be at the periphery of the disk. Very rarely did this configuration produced more than 1 Volt, but in well designed units, the current was measured at more than 100,000 Amperes, only on a brief period of time due to excessive heat buildup. A better solution takes the form of the Radial configuration. This variation takes advantage of the fact that since the electrically conductive cylinder's speed is optimum on its whole surface, the unit electric mass contributes fully to the generation process and the available magnetic energy is better put to use. This configuration is now very popular and it has been the one used in the DePalma's N machine. In an other instance, with this configuration, a self exited Poirson unit ( France ) with a 340 cm diameter cylinder revolving at 1,975 rpm, has been readily producing up to 8 Volts @ 10,000 Amperes. Still another interesting experiment by Faraday demonstrated a different way of employing the Homopolar phenomenon to generate electricity. 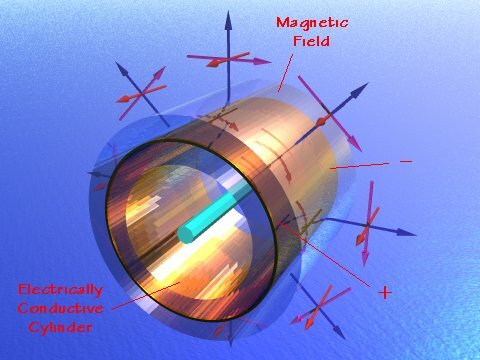 In this axial magnetic field setup, a cylindrical capacitor is made to revolve at great speed. Electricity is generated and picked-up between the interior and exterior electrically conductive cylinders, or in other words on each electrode of the capacitor. The available power attainable by the capacitor his in direct relation with the dielectric constant (k) of the middle isolating layer. This approach has been revisited recently under the US patent 6,051,905 by Clark where he demonstrates a unit in which only the dielectric is made to revolve. Although it is not specifically mentioned, the central dielectric may well be of the liquid type such as water or a gas, permitting a more intimate electrical contact with the conductors. Still another Homopolar device takes the form of a High voltage electrostatic motor. This motor has a rotor made from a electrically conductive cylinder covered over with a thin dielectric for isolation. It is put into rotation when high DC voltage ( > 10,000 Volts ) is connected to the two adjacent fixe cylindrical electric poles that act as the stator. The propulsive Homopolar phenomenon takes place into the dielectric, positioned between two electrically conductive electrode, and the high voltage is required to counter the excessive electrical resistance of the air gap. In this case also, is the dielectric constant (k) of the isolating layer deterministic of the power of the motor. A good demonstrator of the above motor has been built by Jean-Louis Naudin from France. It his design the magnetic field spontaneously forms between the stator and the rotor as the current starts flowing in the air gap and dielectric. When a wire is formed in the shape of a flat spiral and current is made to flow in it, the spiral will start rotating and can be used as a motor by the virtue of the Homopolar phenomenon acting upon it. The flat spiral's current can be viewed as a superposition of a system of circular currents, which provide a magnetic field perpendicular to the plane of the spiral, and a radial current on which the Ampere forces produce a self-torque. The self-torque is always opposite to the sense of the winding. The motoring effect can be greatly increased by providing an isolation of high dielectric constant (k) between successive turns and by also providing a path of high permeability for the magnetic field. The electric current may flow in either polarity, the revolving direction will remain the same. The relative spinning direction can only be changed if one changes the winding direction. Furthermore, if the coil is made to have many turns, it can then rotate on its own magnetic field. There are many other instances where the Homopolar phenomenon is applied if one stops and thinks about it. Our mother Earth for instance is a prime example ( in perpetual motion ! ) and elsewhere also, such as in the case of MHD ( Magneto-Hydro-Dynamics ) processes and Hertzien waves. I am always interested in learning more on this fascinating topic, so please, if you have a genuine and imaginative application of it, do drop me a line including the reference. I hope this brief tour has been beneficial for you and I extend to all my best whishes.